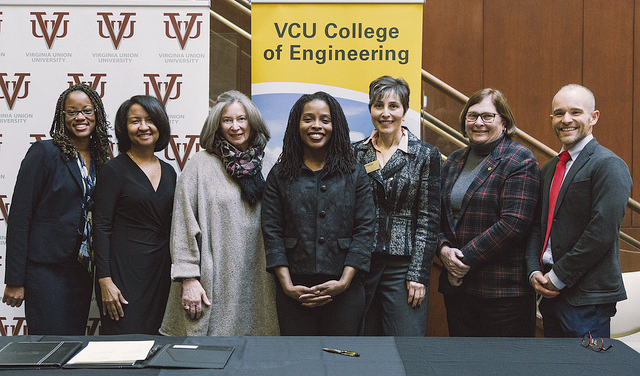 This partnership combines the resources of VCU, a large research university, with those of VUU, Virginia’s oldest historically black university. The effort is in line with both universities’ push to prepare diverse professionals to serve the commonwealth’s academic and workforce goals. The VCU and VUU campuses are within 2 miles of each other in downtown Richmond. Gail Hackett, Ph.D., VCU’s provost and vice president for academic affairs; Joy Goodrich, Ed.D., VUU’s provost and senior vice president for academic affairs; Barbara D. Boyan, Ph.D., the Alice T. and William H. Goodwin Jr. Dean of the VCU College of Engineering; and Gerard McShepard, Ph.D., interim dean of VUU’s School of Arts and Sciences, signed the agreement. “This program is a further testament to VCU’s commitment to the success of underrepresented minority students in STEM fields, as well as our commitment to serving the commonwealth. We are honored to partner with Virginia Union University on this important initiative,” Hackett said. The new program will allow students to earn two degrees concurrently in less time than it would take to complete them sequentially. It also gives students full access to both universities’ services and resources, and widens their professional and personal networks. McShepard said dual-degree programs of this kind are part of VUU’s legacy. Previously, Virginia Union’s mathematics majors had the opportunity to also pursue engineering at VCU. When VUU re-activated its physics major in 2016, it made sense to explore a possible physics-engineering dual degree. “This is a fantastic opportunity for Virginia Commonwealth University and Virginia Union University to rekindle an old engineering partnership,” he said. Mary Gordon, vice president for Altria Client Services and a member of VUU’s Board of Trustees, is a graduate of a similar dual-degree program between Spelman University and Georgia Tech and holds a master’s from VCU. The opportunity for students from a science background to collaborate so closely with engineering students is a big win for all parties, Boyan said.